Professional collectors usually end up putting their collections in museums and automobile enthusiasts are no exception. There are hundreds of private antique, vintage and classic vehicle museums and even more that display related memorabilia. Most museums feature displays as well as educational programs, research libraries, public events and gift shops to nurture the enthusiasts and encourage the wood-be collectors. If you have a collection of interesting automobile memorabilia we would love to hear about it. Please send our webmaster a note. The following museums will feature brass, antique, vintage and classic cars, hot rods, muscle cars, trucks and vans, motorcycles, motor homes and trailers. If you would like to suggest another one, or if you have a concern or comment about a one listed here, please contact our webmaster. https://www.hobbydb.com: Powered by collectors worldwide, hobbyDB is building a giant database of every collectible ever made – from diecast cars to action figures to comic books. But it’s more than just a place to research, browse and reminisce. The database powers a collection management system where users can keep track of their their own collectibles and a marketplace where users can buy or sell items in just a few clicks. It’s a whole collectible ecosystem! Visit us at www.hobbydb.com. https://www.naam.museum/: The National Association of Automobile Museums is a trade organization for the advancement of automobile museums. They offer networking and conferences for all sizes of automobile museum curators in an effort to promote excellence, professionalism and education. https://www.aacamuseum.org/: The Antique Automobile Club of America Museum is affiliated with the Antique Automobile Club of American, located in Hershey, Pennsylvania. It is dedicated to the celebration, preservation, education, and display of the American Motor Vehicle history. Their goal is to provide value for their members, hobbyists, and the general public in association with the Smithsonian Institute. The museum is open to the public and their library is a great resource for those who are trying to identify miscellaneous antique and vintage car parts. The AACA has chapters throughout the United States and puts on car shows, rallies and other events throughout the year. https://theunionstation.org/: The Union Station in Ogden, Utah, houses the Browning-Kimball Classic Car Museum. 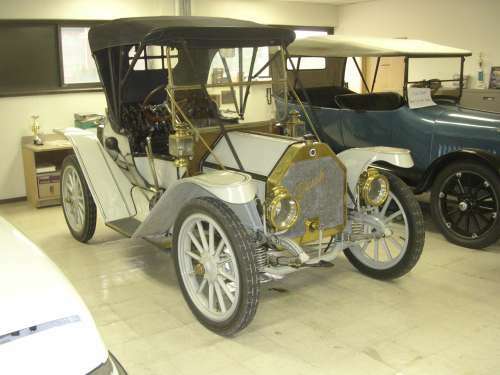 The museum displays vehicles from the "Golden Age" of American history: 1901 to 1930. In 1971 Matt and Barbara Browning started their collection with the 1930 Packard Model 733 Standard Eight Dual Cowl Phaeton. Their passion was rare and pristine original automobiles, resulting in one of the finest collection of prewar Brass American classics. They dedicated the Browning-Kimball antique car museum in 1981 at Ogden’s Historic Union Station where the exhibit still stands and is continually freshened with new and exciting motor cars from their personal collection. It is a family friendly museums and for one low price you cal also visit the Utah State Railroad, John M. Browning Firearms and the Utah Cowboy and Western Heritage museums, located in the same building. https://www.agsem.com/: The Antique Gas and Steam Engine Museum is a nonprofit corporation located in Vista, California. The museum collects, preserves and displays examples of mechanical ingenuity and crafts relating to the early days of the American farm and rural community. They provide educational and recreational exhibits, demonstrations and activities to celebrate the art of inventing to fulfill necessities. Acknowledging the past provides direction for the future. https://www.automobiledrivingmuseum.org/: The Automobile Driving Museum is located in El Segundo, California. They display a collection of restored antique, vintage, classic and special interest cars. They have a rotating collection of 130 vehicles dating back to 1904 in their 28,000 square foot facility. They also have a research library, store and put on events. And every Sunday they take visitors for a ride in one of their vehicles for a trip back in time. https://www.automobilemuseum.org/: The Automobile Museum is all about Auburns, Cords and Duesenbergs and is located in Auburn, Indiana. It is a national historic landmark that has hosted almost two million visitors from all 50 states and from over 40 since it opened in 1974. The museum is in the former Auburn Automobile Company’s national headquarters building, a place where history was made over 75 years ago. Many of the Auburn and Cord automobiles that appear in Auburn, IN, every Labor Day weekend were designed and developed there. https://www.autoworldmuseum.com/: The Auto World Museum located in Fulton, Missouri. The museum features Mr. William E. Backer's vintage automobile collection. They started their collection in the 1950s with the purchase of a 1924 Canadian Dodge touring car and by the 1990s the collection was moved to an old K-Mart building until a more suitable building could be found. The current home displays the vehicles in period settings with billboard size photo backdrops and building facades putting them in proper historic perspective. There are also informational panels with each vehicle and video kiosks that address the various vehicles’ place in human history. https://www.barbermuseum.org/: The Barber Museum is the Vintage Motorsports Museum, located in Birmingham, Alabama. It was started by a Birmingham native, George Barber, who modified, raced and maintained Porsches in the 1960s. Te collected started with classic sports cars in 1989 but soon moved to motorcycles when Barber realized that no museums displayed the history of motorcycles from a global perspective. It is now home to the world's best motorcycle collection, dedicated to the presentation, interpretation, exhibition and history of motorcycles, vintage vehicles and motorsports. https://www.beamtruckmuseum.com/: The Beam Truck Museum is the C. Grier Beam Truck Museum, located in Cherryville, North Carolina. Grier Beam's love for trucks began in 1932 when he borrowed enough money to buy a used truck to haul most anything he could. Over the years he expanded to become the Carolina Freight Carriers Corporation. The C. Grier Beam Truck Museum is now a top attraction to North Carolina visitors from all over the world and is dedicated to both Mr. Beam and the local people who helped him succeed. https://www.boyertownmuseum.org/: The Boyertown Museum of Historic Vehicles is located in Boyertown, Pennsylvania. Boyertown was once a hub for many car, truck and motorcycle builders and the museum displays over 50 examples of the now rare vehicles, as well as many examples of some of the horse-drawn that preceded them. The museum also offers scheduled programs and events, has a research facility for individuals and schools, and sells videos and publications for enjoyment and education. https://www.cusslermuseum.com/: The Cussler Museum is located in Arvada, Colorado. Clive Cussler is the author of the popular Dirk Pitt adventure books that mention many of the vehicles mentioned in his books are on display. However the museum is dedicated to the preservation of astounding rare and vintage automobiles from all over the world and there are over 100 vehicles in the showroom that range from 1906 to 1965 model years. https://www.fountainheadmuseum.com/: The Fountainhead Museum is the fountainhead Antique Auto Museum, located in Fairbanks, Alaska. It is said to be the most northern automobile in American and features both vehicle and Alaskan history in the same building. The collection was started by Tim Cerny, a local who started the collection in 2007. There are now more than 85 vehicles that he chose for their historical significance, innovativeness or rarity from the Antique and Vintage Car Eras. https://www.franklinmuseum.org/: The Franklin Museum is located in Tucson, Arizona. The museum was started by Hubbard R. Franklin to display his personal collection of famous automobiles and is now maintained by the Thomas H. Hubbard Foundation. The Franklin Museum also features an extensive research library, native American artifacts, an historical adobe home and other buildings. https://www.gatewayautomuseum.com/: The Gateway Auto Museum is located in Gateway, Colorado. The museum features over 50 from the private collection of John Hendricks, the founder of the Discovery Channel, encompassing over 100 years of automobile history. The vehicles range from a 1906 Cadillac Model H coupe to a 2006 Mustang; the most expensive car bing the 3.2 million dollar 1954 Oldsmobile F-88 concept car. https://www.larzanderson.org/: The Larz Anderson Auto Museum is located in Boston Massachusetts. Larz Anderson was an American diplomat from a wealthy family and the museum is said to contain the oldest car collection in the United States. It is located in the original carriage house of the Anderson estate and they offer a variety of educational programs for children. https://www.mathewscollection.com/: The Mathews Collection is located in Arvada, Colorado. Harry Mathews developed car washing equipment while amassing an eclectic collection of the some of the World's finest cars. His son and son-in-law have continued the tradition with an emphasis on road racing machines such as McLaren's, Brabhams and Lotus. There are also about 15 Chevrolet Corvettes , motorcycles and English sports cars. https://www.museumofautos.com/: The Museum of Autos is located in Morrilton, Arkansas. The museum was founded in 1964 by the late Arkansas Governor Winthrop Rockefeller. It houses his collection of over 50 antique, vintage and classic vehicles built between 1904 and 1967 and today serves as the headquarters for the Mid-America Old Time Automobile Association (MOTAA) which sponsors car shows and swap meets..
https://www.pierce-arrow.com/: The Pierce-Arrow.com is the Buffalo Transportation Pierce Arrow Museum, located in Buffalo, New York. It was established in 1997 and contains over 40 vehicles from the collection of Jim and Mary Ann Sandoro, New York socialites, which also features Pierce Arrow automobiles, bicycles, motorcycles and a gas station designed by Frank Lloyd Wright. The museum also hosts banquets and other events. https://www.sarasotacarmuseum.org/: The Sarasota Car Museum is, located in Sarasota, Florida. The museum is one of the oldest in the country and features an eclectic collection of classic cars from renown people such as circus master John Ringling's Rolls Royces, John Lennon's Mercedes Benz and Don Garlits dragster. There are over 75 vehicles on display from all over the world. https://www.swigartmuseum.com/: The Swigart Museum is the collection of William E. Swigart, Jr, located in Huntingdon, Pennsylvania. The museum houses the private collection of William Swigart and has been extended by his family over the years to include one-of-a-kind vehicles such as the 1936 Duesenberg 12 cylinder Gentlemen's Speedster and two Tuckers. It also contains a wide variety of memorabilia such as lights, horns, bicycles, toys and clothing and one of the world's largest collections of radiator emblems and license plates. It is only open from Memorial Day weekend through the end of October. https://www.ypsiautoheritage.org/: The Ypsilanti Auto Heritage Museum is located in Ypsilanti, Michigan. The museum represents the heritage of the area and contains over 30 cars that range from a 1933 Hudson Terraplane K Series coach to a 1991 Chevrolet Caprice police car. The collection is housed in the old Miller Motors dealership building that dates back to 1927 when Hudsons, Essexes, Terraplanes and Ramblers were sold there. And the company still sells Hudson partss. https://musclecarranch.com/: The Muscle Car Ranch is a automotive memorabilia museum located in Chickasha, Oklahoma. They have hundreds of thousands of collectable objects from the automobile industry and they have RV spaces and a cabin for rent, as well as a recreational area. They put on car shows and swap meets and will be happy to help you host a special event. Hot Rod Magazine says that the Muscle Car Ranch is among the top destinations for gearheads and road trip enthusiasts. https://www.pedalcarplanet.com/: Pedal Car Planet sells pedal cars and pedal airplanes, retro tricycles, Big Wheels, gas pumps, pedal car kits, foot-powered cars, and other ride-on classic car toys that run on kid power. It is owned and operated by Perez eCompany in Houston, Texas, who strive to provide high quality products at reasonable prices. They offer free shipping within the United Sates.